Purpose Researchers are confronted to numerous definitions of work ability/disability, influenced by their context of emergence, discipline, purpose, underlying paradigm and relationship to time. This study provides an in-depth analysis of the concept through a systematic scoping review and the development of an integrative concept map of work (dis)ability. The research questions are: How has work (dis)ability been conceptualized from the perspectives of research, practice, policy and industry in the published scientific literature? How has the conceptualization of work (dis)ability evolved over time? Methods A search strategy was designed with a library scientist to retrieve scientific publications containing explicit definition(s) of work (dis)ability in leading-edge databases. The screening and the extraction of the definitions were achieved by duplicate assessment. The definitions were subject to a comparative analysis based on the grounded theory approach. Results In total, 423 abstracts were retrieved from the bibliographic databases. After removing duplicates, 280 unique records were screened for inclusion. A final set of 115 publications containing unique original conceptual definitions served as basis for analysis. Conclusions The scientific literature does not reflect a shared, integrated vision of the exact nature and dimensions of work (dis)ability. However, except for a few definitions, there seems to be a consensus that work (dis)ability is a relational concept resulting from the interaction of multiple dimensions that influence each other through different ecological levels. The conceptualization of work (dis)ability also seems to have become more dynamic over time. The way work (dis)ability is defined has important implications for research, compensation and rehabilitation. The online version of this article (doi: 10.1007/s10926-013-9459-4) contains supplementary material, which is available to authorized users. We are grateful to Dr. Anne Foro (University of Montreal) for her careful independent review of the abstracts, papers and definitions. The study was supported by the Work Disability Prevention Canadian Institutes of Health Research (CIHR) Strategic Training Program. V.L. was supported by a Banting and Best Doctoral Research Award from the CIHR and a Doctoral Scholarship from the Robert-Sauvé Occupational Health and Safety Research Institute. US Census Bureau. Methodology for identifying persons with a work disability in the Current Population Survey. Washington: US Census Bureau; 1981–2011 [updated October 11, 2011]; Available from: http://www.census.gov/hhes/www/disability/cps/cpsworkd.html. Fan ZJ, Foley MP, Rauser E, Bonauto DK, Silverstein BA. 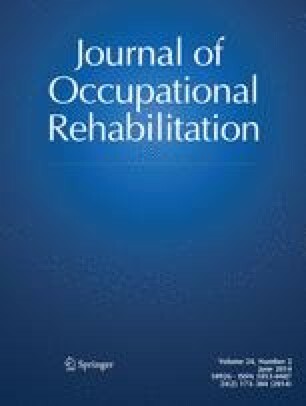 Effects of residential location and work-commuting on long-term work disability. J Occup Rehabil. 2013. doi: 10.1007/s10926-013-9424-2.